This entry was posted on December 3, 2013 by Jessica Anderson. Eewww… what is that nasty thing? Why it’s the Honey Badger, the fiercest trophy on the Trophies2Go website! Honey Badger don’t care, he’ll just eat that cobra! Pop culture icon, the Honey Badger was popularized by the YouTube video sensation. Click here to view the video (warning: contains profanity, not for young ears). This tenacious critter is a symbol for overcoming adversity and just going for what you want in life. As part of our year-end recognition, we award a Product of the Year. This year our fierce honey badger wins the honor! Designed by our staff and created by JDS Industries, this little critter is full of color and personality. 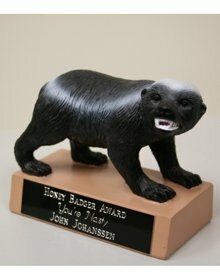 Chosen by companies for a variety of office awards and by sports team for participation awards along with coaches’ gifts, the honey badger is an extremely popular and versatile trophy that can be used for any recognition. Funny and edgy, he brings smiles and laughter to any event. Made of resin, this spunky guy is hand painted in full color. Our customers give him 4.8 out of 5 stars – read the reviews to find out what others think. We offer a honey badger alone, or as a perpetual trophy that can be passed around from person to person. Check them out! Congrats Honey badger! You rock!